Nat Newman is our November guest blogger. She is planning to write a series of posts about women expats. This is her first post. I’m an Australian woman living in Croatia. I’m only 35, but this is the 5th country that I’ve lived in. I’m not a “3rd culture kid” – I didn’t move around much growing up. These are all countries I’ve chosen to live in as an adult, for various reasons. I am one of more than 200 million people living as an expat. The term ‘expat’ is hard to define, but for the purposes of my upcoming posts, I’ll say that it loosely includes all those people who are living, working or studying in a country which they do not consider their ‘home’ country. They may be staying there for a short time, a long time or even forever. They may be there for work, for love, for study or for adventure. Often, it’s a combination of all of these things. Usually, being an ‘expat’ is different from being a ‘refugee’ or a ‘migrant’. As I say, it’s hard to define. But if the expat community were a country, it would be ten times the size of Australia. It may surprise you to learn that the largest group of expatriates from an OECD country comes from the UK. More than 3 million British citizens are choosing to live away from home and every year the number is increasing. The vast majority of these expats are men – who often bring along their ‘trailing spouse’ and family. That phrase sounds awful, doesn’t it? ‘Trailing spouse’ – like you’re being dragged, against your will, by your hair, across the seas and dumped into strange lands. Of course, that’s not the general experience. For a lot of women (trailing spouses are, on the whole, women) they are very much part of the decision making experience. The family or partnership decide together that they will make a life for themselves abroad. Take for example Farrah Gilliani. Farrah and her husband lived in Sweden for a number of years, but now live in Luxembourg, where her husband works in engineering. She always knew, before she set out on her expat adventure with her then-partner (now husband), that they definitely wanted to live abroad. It was just a case of who got a job first. It was him, so they wound up in Sweden. Women who move abroad because of their husbands or partners can sometimes feel as though old gender roles are still in place. Their opportunities to work are limited – and in fact, very often, they’re not expected to work at all. Of course this can be challenging – but it can also be very rewarding. When you’re the ‘trailing’ partner, there’s less pressure on you to work. There’s no guilt associated with staying at home to look after your home and family. In fact, quite the opposite. You can enjoy being a mother and take pride in your work as a home maker without feeling any guilt or need to apologise. As you can guess, though, there’s a certain level of isolation as an expat. It can be hard to make friends. The pool of people from whom you can choose becomes constricted – what are your chances of finding a great friend when there are only 30 people you can communicate with? You make connections where you can – with other mothers, fellow Britons, a book club. You do anything you can to make yourself a safe place, a place you can feel at home. Often, the easiest thing is make yourself a home at home. Socialising can be too hard in a foreign place. It’s hard enough back in the UK! Over the coming posts, you’ll meet some amazing women living all over the world. From raising kids in Sweden to being shot in the Dominican Republic, returning to the homeland of your parents, helping refugees or spending Sundays on the streets of Bogota. These are women who’ve moved with their partners, women who’ve moved for work, women who’ve moved because they couldn’t stay still. What they all have in common is the desire to do something. Whether that’s volunteering or setting up a magazine, they all need to be doing. I guess we all feel like that. Perhaps there’s something about moving to a new land that makes it clear that you can and will contribute to your greater community in some way. Because all of these women are making projects for themselves, contributing in substantial ways to their new communities, building strong international ties and being great ambassadors. That’s the thing about being an expat – at some point, someone will think of you as a representative of your home country, even if you don’t feel like it! I hope you enjoy meeting these sensational women who’ve chosen to make another country home. Bok i živjeli! The above photo illustrates a woman lying outside on her back. 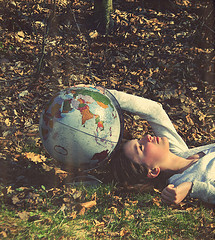 Above her head is a globe and she is touching it with her hand. Thanks martinak15 for the photo! The guest blogger could have at least made a small effort to establish the distinction between “expats” and migrants. It’s not so hard to identify the differences as the connotations of the two terms are quite contrasting. The label “expats” or expatriates usually suggest socio-economic privilege, of not being forced to move across borders because of poverty or persecution. Usually, the expat is white. A white person working and living in another country, especially one poorer than their homeland, may object to being called a migrant or worse, immigrant. Alicia makes an interesting point regarding ‘migrants’, ‘immigrants’ and expats’. They all allude to people who have left their homes and moved to a new place or region (as I have done myself – London, UK to Bogota, Colombia); there are differences but I don’t think this is as controversial as Alicia suggests. To ‘migrate’ is ‘to move from one country or region to another’, often in search of work or better living conditions. Arguably from some perspectives, I am a migrant because in certain ways my living conditions ARE better here than in London, in terms of the cost of living. An ‘immigrant’ is a person who migrates to another country, usually for permanent residence. While I hope that my move isn’t permanent, it’s certainly indefinite, as my partner is Colombian; therefore I AM also an immigrant (and, incidentally, this term doesn’t have negative connotations here). Expats.. Alicia said that expats are ‘usually not being forced to move across borders’. In many cases this is true, but with regard to UK citizens at least, being forced to move to another country in order to be with the person you love is becoming a more and more common (and harsh) reality, as the Home Secretary and Conservative government make it very difficult even for married couples to live together in the UK when one spouse is from outside of the EU. That’s why I am in Colombia. One definition of an ‘expat’ is a ‘resident in a foreign country’, but interestingly, in archaic terms, it’s also a person ‘exiled or banished from one’s native country’. I had to choose between staying in the UK and effectively ending my relationship, or being forced into exile in order to be with the person I love; thus I do feel that I have become an expat (in all senses of the word) persecuted by my government for having a partner from outside of the EU. In terms of socio-economic privilege, I was lucky enough to get a good job here, but other expats just have to do whatever work comes up and it can be difficult to get by, especially in the beginning. And to say that expats are normally white… well there are plenty of expats in Bogota who are not white; this was also my experience in Buenos Aires, and I have a number of friends living in Japan, for example, who are also not white. In conclusion, I’m a white person living and working in a country poorer than my own, but I am, by definition, a migrant, an immigrant and an expat (without objection)! I think the interpretation of the three terms really depends on where you live and where you’re from. I expect guest blogger Nat will explore what it means to be an expat in different circumstances. i do find the expat/immigrant distinction fascinating. i’m an American living permanently in the UK with my British spouse, so i tend to call myself an immigrant. to my mind there’s something transitory about ‘expat’ – it feels like the label for someone who might go back to their home country one day, or at least will always think of that as their ‘real’ home. and that doesn’t fit me – now i feel at least as at home here. this is where i live, and where i expect to have and raise children and spend the rest of my life. on the other hand, Alicia’s definition – white, privileged, not moving out of necessicity (unless you consider being with the person you love to be a necessicity but that’s a complicated question) – certainly fits me. i never suffered poverty or persecution and it’s the fact that i am privileged that allowed me to study abroad in university and meet my now-spouse. does that make me an expat? but sometimes when i call myself an immigrant i wonder if i’m being the fraud, claiming a label generally associated with a struggling minority group? or is a good thing to point out that ‘immigrant’ includes the sort of people that the Daily Mail/UKIP/etc. types probably wouldn’t object to? i just don’t think the lines are very clear. I really appreciate Naomi and lucifermourning for responding to my comment. Calling yourself migrant or immigrant and not (refusing?) to see the negative connotations is one thing, others calling you ‘x’ and being nice to you/racially violent is quite another. Like Naomi says, it certainly depends on where you are and I would add, who you are, ethnically-speaking, to put it very crudely. In western Europe, not being white marks you out immediately as a migrant or immigrant. When anti-immigration sentiments are at fever pitch, you may expect to be told to ‘Go home to where you come from’ on the street by a total stranger as I have. If you are a native, you’re asked, ‘But where do you REALLY come from?’ Such is the reality and history of the non-white migrant class. Now, white migrants in East and Southeast Asia are treated like kings and queens. In addition to the fact that white people are thought to be moneyed tourists or precious talent, their presence is generally very much welcomed. Be Black or a South Asian migrant or a poorer Asian neighbour, and you may expect to be treated badly by locals. Dressing up like you’re middle class is not enough as I have learned while being in Hong Kong. I suppose the difference with being white Americans, Europeans, or Australians in the UK or Europe is that you can ‘pass’ for a native and escape the incriminating looks from strangers who think you’re in the country to siphon off benefits. Lastly, I’m not trying to dismiss the experiences of white migrants/immigrants or expats who may have their own complicated experiences of migration. But I do feel that we are all implicated, whether we like it or not, in the contextual web of migration and are differentially impacted by it. Nat Newman here! Thanks everyone for the comments. I agree Alicia, I was sloppy in not defining the distinction between migrants and expats. As Naomi points out, it’s pretty complicated. All of the women I spoke to in this series define themselves as ‘expat’ or at least as ‘foreign’ in their adopted homes, although none of them have any plans to return to the UK. I think the term has moved on and no longer means only people of a particular socio-economic group. There are more opportunities than ever for British people to live and work abroad and more and more are doing so. I think a series on migrants living in the UK would be a great feature for the F Word to look at next. The plight of women migrants, those destitute migrants in limbo who can neither work nor leave, is a very grave issue.